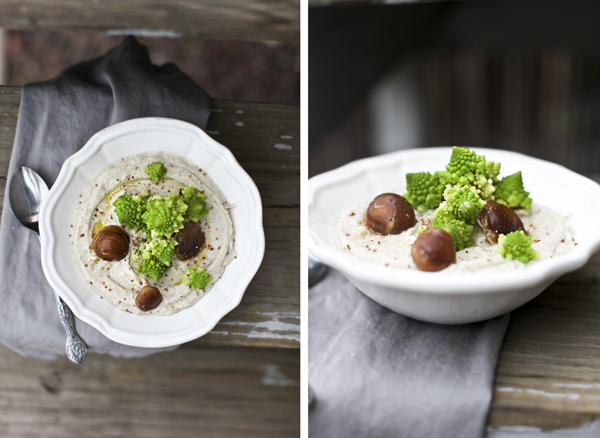 Cauliflower Puree & Romanesco — Cohabitate Co.
Romanesco, Romanesco, ROMANESCO.....When I saw this vegetable at the grocery store, there were only two remaining. 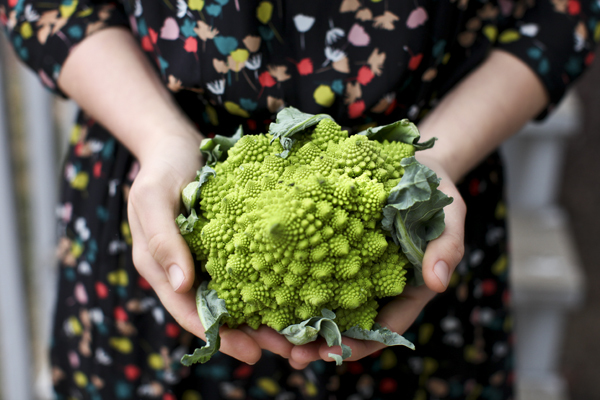 I grabbed them faster that you could say- Romanesco. Both enticing and curious; honestly, something about this vegetable makes me think extraterrestrial. Not quite broccoli, not exactly cauliflower, it has a delicate nutty flavor and is wonderfully crunchy. This is one tasty treat that we never had growing up in south Georgia. This is my first time cooking this green marvel. I now imagine it in salads, pastas, or as a simple side dish. The possibilities are endless. I will definitely be incorporating it into my mealtime whenever I can actually get me hands on it! Love. This. Veggie. *You need a blender for this recipe. 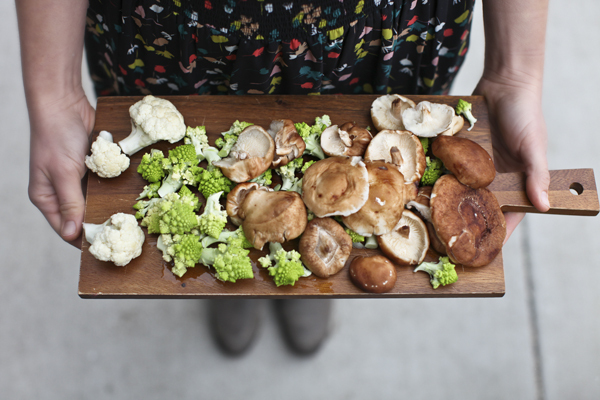 Start by washing your veggies and mushrooms well. Cut you cauliflower and romanesco into larger pieces. Trim off the tough ends of your shiitakes. Chop your onion. Mince your garlic. Place your cauliflower and shiitakes and most of your onion and garlic in a sauce pan. Set aside about 1/4 of your onion and garlic for your romanesco. You will steam it separately. I left out a few shiitakes too for toppers. Add a little water (about 1/4 in just covering the bottom of your pan), and olive oil to your cauliflower, but save a couple of tablespoons of olive oil too. Cover and let steam until your cauliflower is tender, on med/low for about 8 minutes. In a separate saucepan, place your cut romanesco, a couple of shiitakes, your remaining onion, garlic, olive oil and about 1/4 in. of water. Cover and let steam over a med/low heat for about 6 minutes. Your romanesco should still be firm. Once your cauliflower is cooked. Place all the contents of the cauliflower sauce pan in a blender and puree, adding 1/4 c. of almond milk. You may add more almond milk if you like a creamier consistency. 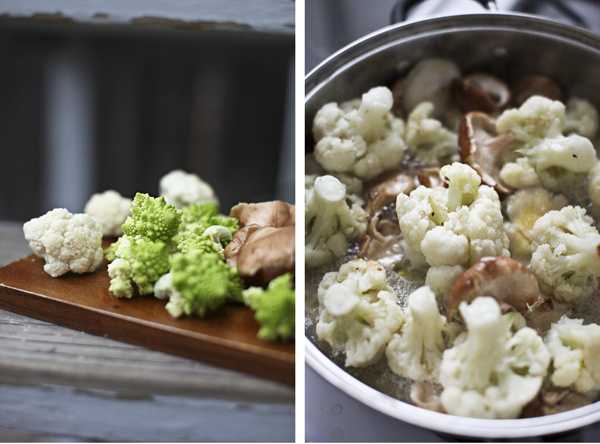 Serve up cauliflower puree and top with steamed romanesco and a couple of shiitakes. Finish with a drizzle of good olive oil and/or truffle oil, sea salt and pepper. Enjoy!